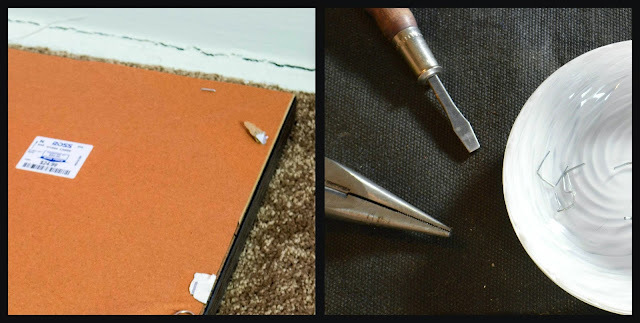 As promised, I'm back with one more small money-saving nursery project for the week. 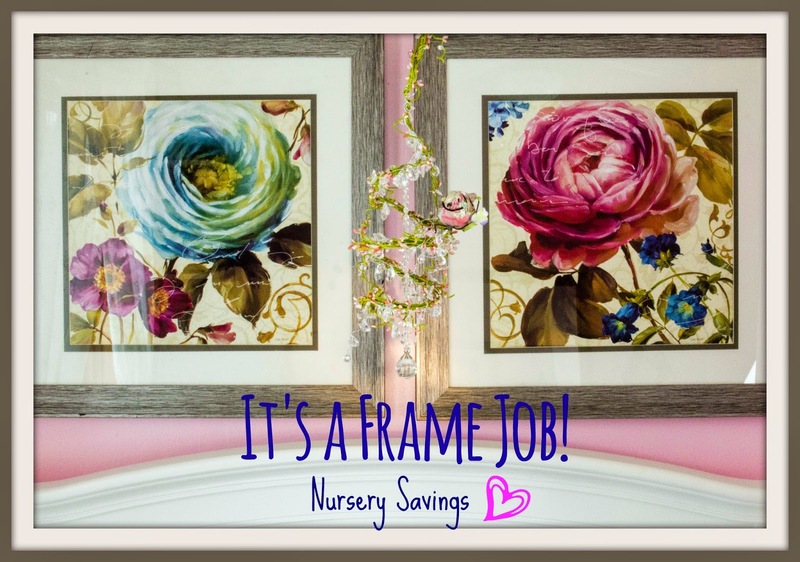 This is one of my biggest savings so far with the nursery and I am so. darn. pleased with how it turned out. 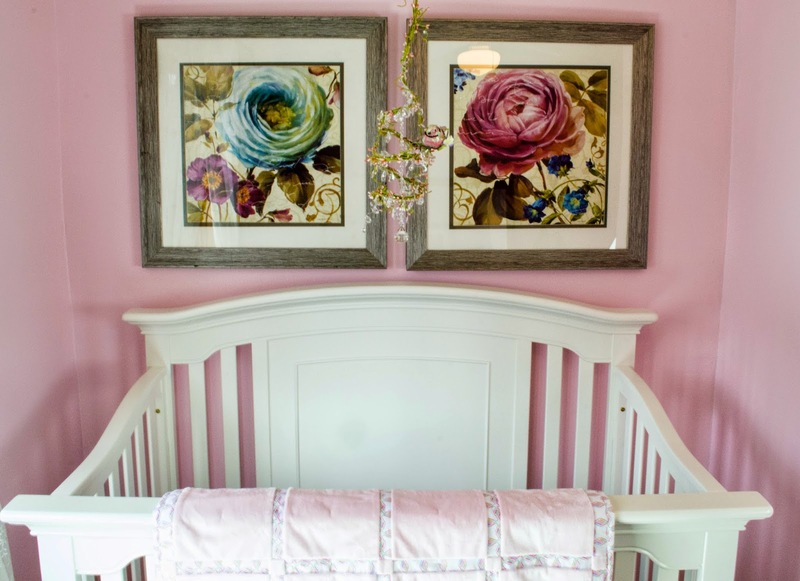 When I was dreaming about what kind of nursery I wanted to make for my daughter, I found myself coming back to a few key ideas. I wanted something that was completely girly (I mean, isn't this part of the fun?). I wanted something that had some magic and whimsy to it, but also managed to be a little bit sophisticated. And mostly, I wanted something that relied on pieces that could go beyond the baby-stages and be reused (somewhere in the house, if not her bedroom) for years to come. This last idea presented a problem, when it came to wall art. Though there are plenty of adorable nursery pictures out there, most of them would be too kiddish to be of use in a few years. Owls, giraffes, elephants, balloons and alphabets - they're all cute, but by the time my little one gets part way through elementary school, they're going to be a bit too babyish. I considered framing some fabric, but I couldn't find any that incorporated the colors that I had chosen (pale pink, white and navy). I even went looking at more grown-up art - giant chandeliers or French fashion inspired prints - but they all seemed, well, too grown up. Finally, I stumbled across a 2 piece print set on Amazon that was absolutely perfect. The art is by Lisa Audit, and the series is called Victoria's Dream. In it, large bloom flowers seem like something picked out of a magic garden; the colors are bright and vivacious with shades of pinks, greens and, blues; even the curlicues mimicked the Crystal and Floral Mobile I made. I was beyond thrilled!! Then I looked at the price tag. To buy a framed version of ONE of these prints, it would cost me $161. If I wanted it framed and matted (which I did), it was $210 per picture. And then, of course, there was the cost of shipping. Ugh. No matter how much I liked them, I couldn't justify spending that much. I spent a few days trying to find something else that I liked, but kept coming back to these Lisa Audit prints. So I decided to take a chance. Instead of purchasing the expensive, framed versions, I found and ordered large posters of the prints for $12 each (and both were prime eligible, so no shipping!). Then I set about trying to find a way to frame them. To have art custom framed can be extremely costly (no matter how many coupons you print off! ), so that was out. And, unfortunately, the large size and square shape of the posters made it impossible to find an empty, ready-made frame at a store. So instead, I began looking for already framed art at discount home decor stores like Ross, Marshalls and TJ Maxx. And lady luck was on my side. Forgive the crappy quality - it's a cell pic! 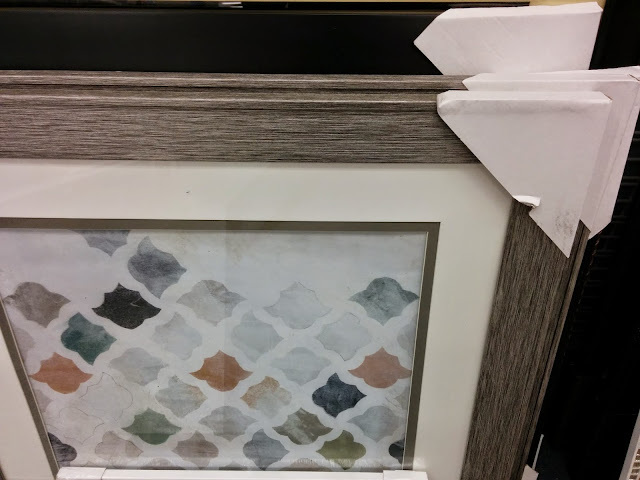 At a Ross Dress for Less I found a 28" x 28" picture with double matting for $25. And, as fortune continued to smile, I found another at a second location. Woot! I have to say, initially I thought I wanted gold frames for the pictures and I wasn't thrilled with these. They seemed plain - straight edges, straight lines, silver/grey color. But when I got them home and had them next to the poster prints, I realized that all of that was actually PERFECT. It counterbalanced all of the uber girly aspects of the room, popped off the pink walls, and allowed the pictures themselves to shine a little bit more. I love happy accidents! 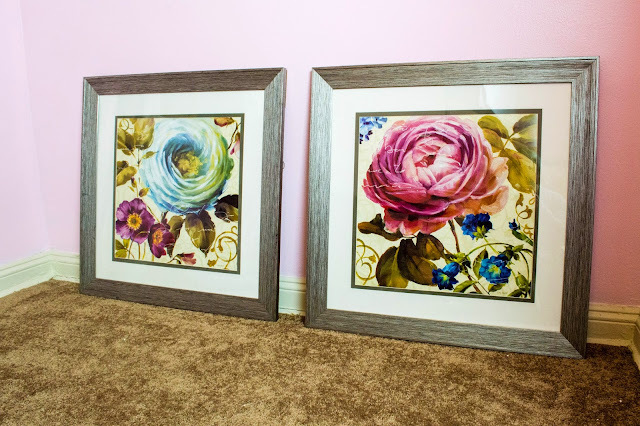 The next step was to carefully remove the artwork that was already in the frames. 1. I temporarily removed the D-Ring hangers with a Phillips head screw driver and set them aside. 2. Using an X-acto knife, I sliced off the brown paper covering the back. 4. I had been hoping to just peel the prints that were already in the frames away, but they were apparently glued to the matting with some sort of cement substance meant to withstand nuclear blasts. Again, using the X-acto knife, I very carefully sliced the prints away from the matting. 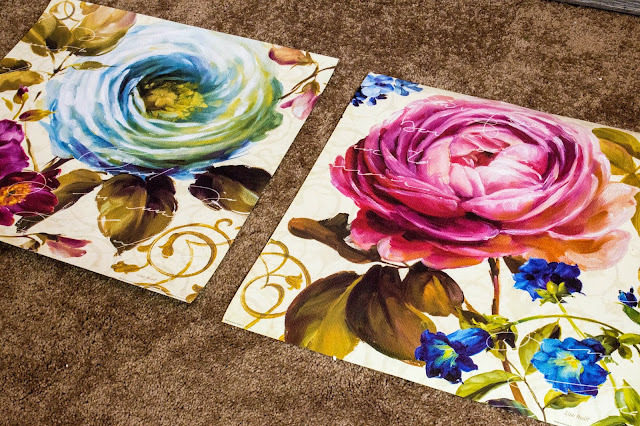 This was probably the longest part of the process as I had to be very cautious not to cut or rip the matting itself. 6. Putting it all back together was easy-peasy. The foam backing was reattached using my trusty staple gun, and a wide border of tape (just for added protection and to pad the staples a bit). Then I reattached the D-Rings, added picture wire and Bam! Bob's Your Uncle! As I said, I am So Pleased with how these turned out. 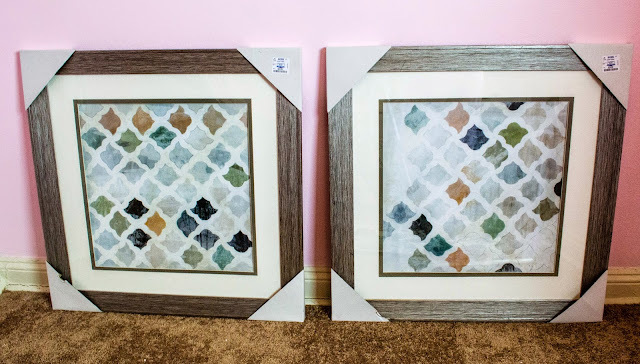 They were far less expensive than most nursery art and I feel like they'll last us longer. I love their size too. I'm a big fan of BIG art. Small pictures and paintings so often get lost on walls. They also showcase the mobile in front, instead of competing with it, which is great, cause I'm kinda proud of it. Pretty crib + Pretty Prints = Happy Mama! It won't be too much longer now til things are all in place and I can do the big reveal! With baby showers coming up, I'm sure I'll have so many things to showcase and place - I am truly one lucky girl! !